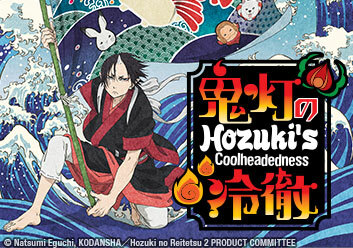 The second season of the supernatural comedy Hozuki’s Coolheadedness thrusts viewers back into Eternal Hell! Just as in this life, the afterlife needs a calm troubleshooter to deal with the bureaucratic headaches that come from keeeping things in order. After all, Lord Enma is a very busy (and kind of incompetent) overlord, and he needs the help of his most charismatic shadow hero to keep Hell from calling into chaos. Enter Hozuki: a cool and collected demon who’s badly in need of a vacation. While Lord Enma is passing judgement on the denizens of hell, we learn about Hozuki's past. Was he always a demon or was he once human? Hozuki takes Maki and Miki around as hell minions for the day to capture special tortures that have never been shot on film! To be shared on their homepage, of course. The Four Benevolent Beasts argue over a meal about who is older and how well they are aging. Meanwhile, Hozuki has some problems of his own down in Hell. Koban the paparazzo gets an interview with Mustard. When Hozuki gets involved in the interview as well, Koban gets far more of a performance than he bargained for. After continually being mistaken for the Great King Enma, King Shinko muses about how he should differ himself to avoid future confusion with the deceased. We get a look at Young Hozuki and what he was like when he was younger. Later, Hozuki has to deal with some children who ended up in Hell. The inventions and ideas of the Engineering Department are being discussed while Young Hozuki tries to make sense of it all. Young Hozuki accidently discovers the dead and meets quite a unique King with an extraordinary power. Hozuki is questioned about his humdrum, daily program in the normal world. Meanwhile, the Gods demonstrate their extraordinary matchmaking capabilities. Hozuki, with great reluctance, agrees to take a vacation for the weekend. In the meantime, the dogs bicker as they try to distinguish themselves amongst each other. Shiro discovers the mighty Scales of Karma and yearns to do one more thing that will make him an accomplished dog of hell. The arrival of a special guest brings an unceasing barrage of annoyances as Hozuki prepares for the end of year party. Hozuki conducts interviews while dealing with a fraud and all the newcomers. Learning about witches and girls western clothing bring about a whole new set of annoyances for Hozuki. Dealing with flesh-eating demons is a lot easier than receiving a vaccination (only if you're Hozuki, of course). Love is a complicated thing, especially when the police and eons of family feuding are involved. Leave it to Hozuki to talk about...employee benefits? A stranded crane presents a set of holy and annoying problems for Hozuki, who was only trying to be... nice? Hozuki learns that self-deprecation and laziness isn’t just for the Mundane world but is still just as annoying. How… tragic. Shiro, Rurio and Kakisuke take some time off at the Arcade and run into some interesting people. Hozuki has to entertain some new guests, hooray? The tiny and hellishly mighty Mustard describes her typical day of writing in her diary, looking for a partner and torturing souls. Hozuki, the ever eccentric man, is invited to teach young children about Hell. What could possibly go awry? After some intense training with Hozuki, Mustard is ready for battle (even if her opponents are less than awake)! Hozuki teaches his "pets" about the old people that dwell at the Sanzu River bank and the monsters within, but it proves to be more of a headache than anticipated. Momotaro returns to the fabled Ogre Island in response to a recent incident. Later, Hozuki visits the court of King Shoko, where animals are called as material witnesses. Hozuki uses the apathetic nature of the Zashiki Warashi twins to wrangle a newcomer to Hell. Later, Hozuki settles a disagreement between different departments.